For some reason, it seems that in the South we have better snake stories that in other parts of the world. I remember sitting around a table at Whataburger in Texas with some old guys and they had some great snake stories to tell… But, we aren’t here to exchange snake tales today. The reason I left you in Crete was to set in order the remaining matters and to appoint elders in every town, as I directed you. An elder must be blameless, the husband of one wife, with faithful children who cannot be charged with dissipation or rebellion. For the overseer must be blameless as one entrusted with God’s work, not arrogant, not prone to anger, not a drunkard, not violent, not greedy for gain. Instead he must be hospitable, devoted to what is good, sensible, upright, devout, and self-controlled. He must hold firmly to the faithful message as it has been taught, so that he will be able to give exhortation in such healthy teaching and correct those who speak against it. This is a controversial passage, because we see things like “the husband of one wife” and “faithful children who cannot be charged with dissipation or rebellion.” Wait a minute, isn’t this verse about choosing an overseer to serve in local church leadership? Why are we examining his divorce record and children instead of only examining the candidate himself? Let’s return to the snake analogy. All snakes are good and have some role in their environment. For example, the harmless prairie kingsnake helps control the rodent population. Rattlesnakes are beautiful (at least in my backwoods redneck mind, anyway), but since they are venomous, they are dangerous for children to play with. If the rule is, “Don’t touch venomous snakes,” then a child is likely to pick up a rattlesnake to take to dad and ask, “Is this one venomous?” and perhaps be bitten in the process. If instead the rule is, “Don’t touch any snakes,” then the child may miss out on playing with a kingsnake, but he won’t be bitten by a rattlesnake in the meantime. God doesn’t want venomous personalities in authority over the local church. Just as an old redneck can look at a snake’s head and tell if it is venomous, God can look at a man’s heart and tell if he’s venomous, but the ones who actually need to make the discernment do not have the insight that the father/Father has, so simplified rules provide a safety net from the venomous ones. The guidelines set in Titus 1:5–9 protect the church by barring those who have divorces or rebellious children from serving in this capacity. This does not mean that every man who has had a divorce is a bad husband, or that every man with a rebellious child is a bad father. There could be a host of reasons for the problems at home. Just as forbidding a child to play with any snake protects him even if it forbids playing with harmless snakes, forbidding any divorcé from serving in leadership protects the church even if it forbids some potentially great leaders in the meantime. 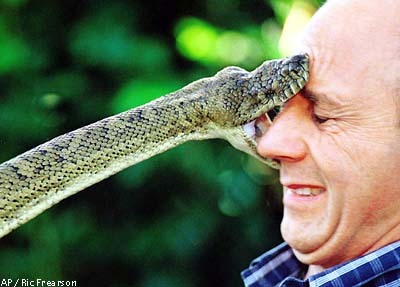 Several years ago, I heard of an unfortunate example of a church playing with a venomous snake. A manipulative man had just run his second marriage into the ground and alienated his children. He then moved to a different city where he threw a pity party for himself and gained the trust of a local church and was given a position of leadership over a ministry committee.1 It was not long before this man had caused a schism within the committee and alienated several church members from the ministries where they had been so cheerfully serving. It is a trend with this man: he splits his family, he splits God’s family; he alienates his children, he alienates God’s children. In retrospect, it seems apparent that the man is a rattlesnake, but at the time, perhaps it was difficult to discern whether he was dangerous or not (after all, a good manipulator will be able to fool those around him). Perhaps a better thing to do would have been to put the man in a less authoritative position, perhaps as a committee member, rather than committee leader. By no means should being divorced or having rebellious children prevent someone from serving in the local church. We are all broken and have ugly pasts. It’s just that men in this particular category are restricted in their service from being in the role of overseer. Regardless of your past, there is a way you can be serving right now. When I was a kid, my father took me to see a Mark Twain impersonator. He recited various excerpts from Mark Twain’s writings and it was a real good time. I still remember it to this day. There was one particular story he told from A Tramp Abroad that has stuck with me as the way he delivered it was just perfect. Anyhoo, I am reproducing it here, mainly for your entertainment, but also because I’m trying to test a new feature on the site. I wonder just how shocked folks were when Peter and John taught in the temple. They were arrested for teaching “in Jesus the resurrection from the dead” (Acts 4:2). We know that “the dead in Christ will rise first” (1 Thess 4:16), so it sounds to me like they were teaching the rapture, not the Great White Throne.